Matt Younkin is a third generation pilot. He is the son of Bobby Younkin who is considered to be one of the greatest airshow pilots of all time. Matt is also the grandson of Jim Younkin who is well-known for designing Century and Trutrak autopilots as well as building replicas of the 1930’s Howard “Mr. Mulligan” and Travel Air “Mystery Ship” race planes. Matt learned to fly at the age of 14 in a Piper J-3 Cub. 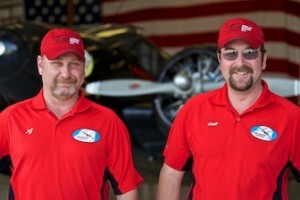 At age 15, the same instructor who taught Bobby how to fly, refined Matt’s piloting skills. On his sixteenth birthday, Matt soloed his grandfather’s 1928 Travel Air 4000 biplane. 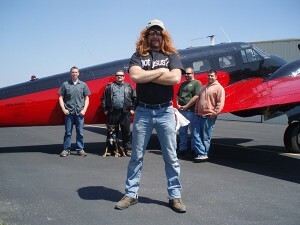 Matt to date has flown over 85 different types of airplanes ranging from the Piper Cub to the Boeing B-29. He is also a fully rated flight instructor, has over 5,000 hours of total flying time, and currently resides in Siloam Springs, AR. When Matt took the Decathlon out to perfect his slow rolls, he soon discovered that he could perform every maneuver that Bobby performed in the airplane at shows, plus a few new ones of his own. Matt spent his first couple of years in the industry performing at airshows in the Super Decathlon and in the world’s only flying example of the Travel Air “Mystery Ship.” At Sun n Fun 2007, Matt debut his version of the aerobatic act made famous by his father in the Beech 18. This act continues to be described by producers and fans alike as one of the most beautiful and graceful displays the industry has to offer. Matt’s latest and greatest achievement is perfecting the world’s only night aerobatic display in a Beech 18. Equipped with over 50 externally visible lights, the top airplane appears to glow in the dark while the bottom side twinkles violently. Combined with smoke, noise, choreography, and an incredible musical score, the Twin Beech Night Spectacular is quickly becoming one of the most sought after acts in the airshow arena. 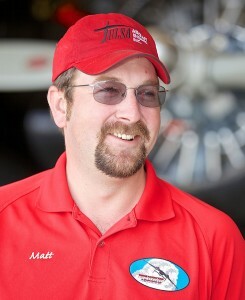 At Airventure 2012, Matt became the first second-generation recipient of the coveted Bill Barber Award for Showmanship. Considered young in the airshow industry by some and a veteran by others, Matt continues to amaze airshow goers with his unique ability to capture the crowd in the moment, much the same way his father Bobby and sister Amanda did for so many years. Look for Matt and his Twin Beech at an airshow near you for many years to come. 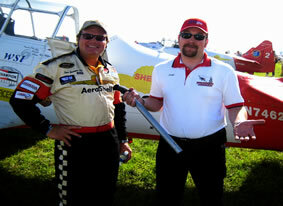 Jeff Gibbs is the chief mechanic for Younkin Airshows, Inc. He holds both Airframe/ Powerplant and Aircraft Inspector certificates. Jeff services and maintains all three of Matt’s airshow airplanes as well as all other airplanes owned by the Younkin family. Jeff grew up in Southern Missouri. After a three year tour with the United States Army, Jeff went to college at the Spartan School of Aeronautics. 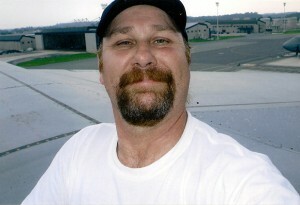 He graduated with honors in 1989, and now holds an associates degree in Aviation Science. Jeff’s first aviation job was a Jet Engine Overhaul Inspector for Teledyne Industries, Inc. based in Neosho, MO. A year later, he went to work for World Wide Aircraft Services in Springfield, MO, where he performed heavy maintenance and cargo conversions on Saab 340s and Metro Liners. In 1998, Jeff began a seven year stent with Wal-Mart Aviation. Starting as a Maintenance Technician, Jeff worked his way through the ranks all the way to become Chief Inspector over the Avionics Repair Station. With his vast sheet metal, avionics, and inspection skills thoroughly honed in, Jeff left WalMart Aviation to pursue a career as an on demand aviation mechanic. The C-18S that Matt performs in today was completely restored in 2000. However, for many reasons, the airplane was still a work in progress and was lacking many safety related improvements that needed to be made. In 2007, Blue Skies Aircraft Maintenance offered to sponsor a condition inspection on the Younkin Beech 18. Jeff was called in to do the majority of the inspection because the full time mechanics of Blue Skies were busy on other projects. In addition to upgrading a large amount of the existing equipment, Jeff also made some discoveries on the airframe that if left unattended would have proven fatal. Many other mechanics had been over the airplane with a fine-toothed comb in the past but had not seen these fatal flaws. Needless to say, from that time on, Jeff was the man for the job any time heavy maintenance was required. In late 2007, Jeff was solely responsible for turning Matt’s idea of putting an overwhelming amount of ridiculous lights on the Beech 18 for the 2008 début of his night show. Matt perfected the concept and Jeff engineered the final result which has become one of the most sought after acts in the nighttime airshow lineup. Jeff currently resides in Jane, MO with his loving wife Tammy and their children Tianna and Jeremy. Miss Ellie serves as the group’s official mascot. 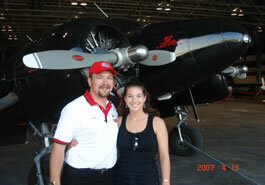 Matt Younkin has always been proud of the fact that his Beech 18 is in fact a 1943 warbird. The airplane, with the exception of the paint scene is basically as it was when sold surplus in 1945. Matt has long since been looking for the perfect nose art to compliment the airplane and the act. “Miss Ellie” is the answer! 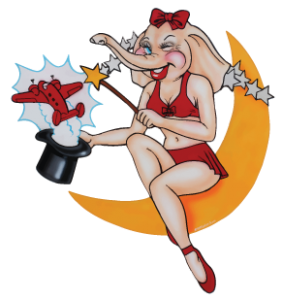 Those who have seen the Beech 18 daytime performance can recall the lighthearted “Pink Elephants” music that begins and ends the show. As the airplane lumbers down the runway in preparation for the roll on takeoff, soundtrack capitalizes on an overly obese airplane attempting aerobatic maneuvers that its designers never intended on. After a graceful aerobatic demonstration, the performance is concluded with a dutch rolling dirty pass dubbed the “Elephant Waltz” which is set to that same corny music. Therefore, airshow spectators have often referred to the Beech 18 as the “White Elephant” of the airshow industry. In addition, there are those who can’t help but laugh as the big Beech performs to such appropriate music. In stark contrast, Matt Younkin’s Night Aerobatic Spectacular is bold, powerful, and anything but big and clumsy. Matt saw this new act as the perfect opportunity to engineer a mascot whose incredible beauty could tie the two shows together. Now in proper World War Two attire, “Miss Ellie” proudly takes her place of honor on the nose of Younkin’s 1943 C-18S, dubbed “Magic by Moonlight.” Look for her appearance in advertisements, on t-shirts, and on the airplane at an airshow near you!